The ability to share your screen with a remote team member is an essential piece of the remote collaboration toolkit. When it comes to screensharing software, there is a dazzling, sometimes baffling array of options. Here are a few I know of. Skype has built-in screensharing. It is currently display-only, but it works across all platforms. They appear to be using the same video compression technology for it as they do for their video chat, which means that while the picture can be a bit blurry, it copes well with temporary network slowdowns. Good old VNC is still one of the most robust and cross-platform solutions for sharing desktop control. There are multiple VNC clients and servers for every OS, both free and paid. DimDim, Yugma, YuuGuu are all launchable from the web, all have names that sound like baby-talk, work across platforms, and feature various added functionality such as file sharing and whiteboards. FuzeMeeting and Adobe Connect are both online meeting tools which feature screensharing along with video chat and many other features. LogMeIn works on Macs and PCs. I’ve heard good things about its performance. TeamViewer has a desktop client that boasts impressive cross-platform support (including excellent Linux support, something that is lacking in many other offerings). I’ve been testing it out lately and it is exceptionally speedy compared to some other tools I’ve used. Mikogo supports sharing for up to ten people on macs and PCs. For Mac-only teams, iChat comes with built-in screensharing as well. What screensharing software have you used? What is your team using now? What do you like or dislike about it? For mac only teams, Apple screen sharing is really good too. I use that over ichat when I’m pairing with another mac user. Thanks for the shout out, Avdi! We sure do have screen sharing! 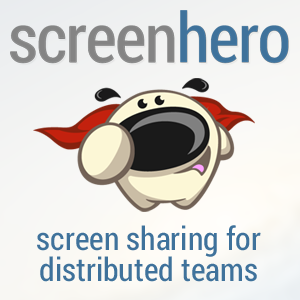 Screen sharing is a great way to show off a new application or train folks on software. However, if you’re showing something like high res images or a video, it’s ALWAYS better to upload the content to the meeting and present straight from the cloud. That way, the clarity and integrity of the original presentation will be preserved. Good luck with your blogging! Thanks for the note, it seems like a cool product! How about Mikogo? It’s a free easy screen sharing solution for both remote support and web conferencing. With Mikogo you can share your screen, and remote keyboard/mouse control, with up to 10 people. Plus many more features. Great way to cut down on travel costs while still having meetings with colleagues on the other side of the world. More info at http://www.mikogo.com/ Feel free to contact me if you have questions. Thanks, I added Mikogo to the list! Thanks for that! Btw, we are working on the release of Mikogo Version 4. I’ll keep you posted on this in case you’re interested in checking out the new Mikogo software and features. Hi there, I wish for to subscribe for this webpage to obtain hottest updates, therefore where can i do it please help.